Da Nang is about 40-minutes north along the coast from Hoi An. The city sits back from the beach across a river that runs parallel to the coastline. We chose accommodation towards the south end of the beach, in amongst an area of empty lots and plenty of development. Despite the ongoing work, the area was pretty quiet and we enjoyed a walk of less than 10-minutes to the beach. We felt a little isolated but the beauty of the coastline made up for this. I’ve said before that I doubt many people think of Vietnam for the beaches. On our first day, it seemed we had the beach to ourselves. The water in Da Nang was warmer than any point we had experienced along the coast in Vietnam and, with fewer tourists, more appealing to us for relaxing. Our accommodation was at Kien Cuong 2 and was pretty comfortable at $18USD per night including, what had become, the classic Vietnamese style buffet breakfast. I was typically cautious with the cooked food that had possibly sat in pots for a number of days and steered towards fruit, cereals, and cakes where possible. Upon checking in we ventured to our room on the fifth floor. As I started to unlock the door I could hear a rustle of activity from behind the door which caused me to slow my actions. Before I could tentatively open the door an Asian lady opened it from the inside! Apparently, they were already staying in the room – we hastily headed back down to the front desk. To be honest I wasn’t totally surprised by the incident – we relocated to a room on the sixth floor. Sometimes you have to hunt out the internet! On our second day in town, we decided to take a walk along the beach to see if anyone did actually use it apart from us. We headed north on the coastline. Despite the number of hotels and resorts springing up, the beach remained relatively quiet and we walked for about 40-minutes before coming to a cluster of large restaurants on the beach front. Just past this, and to my absolute delight, were two outdoor basketball courts set up on the beachside. The courts were temporary in nature and there for a tournament so we lurked for a little while until we saw someone come along with a ball. This was all I needed as I proceeded to put up some shots with a stranger – I love how basketball provides an ice-breaker and common ground for people to interact. We played for about half hour until more people started arriving for the tournament. Shooting hoops, Da Nang’num style. Sorry. By this time, late afternoon, the beach had started to fill up. It appeared that many of the locals will head to the beach after work and, what was a deserted beach a few hours before, became a hive of activity and family fun as hundreds of people descended to the water to cool off after the day. 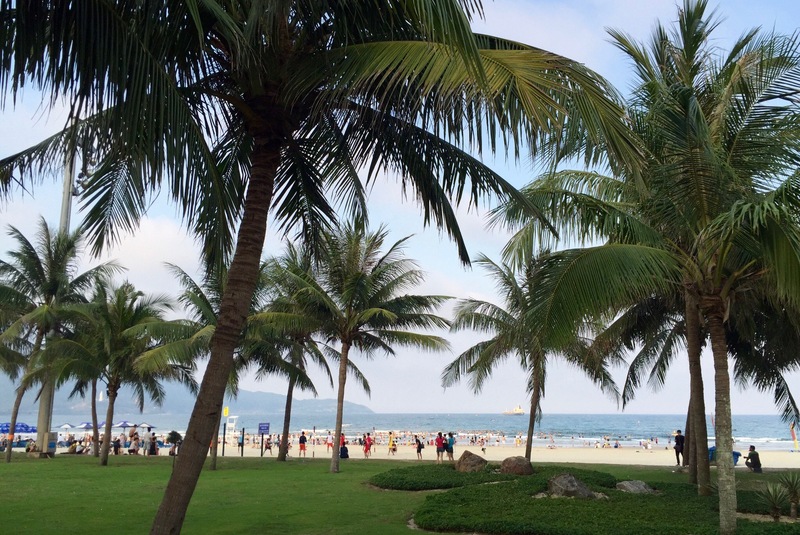 I really enjoyed Da Nang, and Lou did too, although her favorite beach was Nha Trang. Down in Nha Trang, there is more to do and a better choice of food but the beach area is much more developed. We could see that Da Nang will get busier over the coming years as more and more people discover what a great destination it is. For a 30-minute cab ride, Lou was keen to venture to the headlands in Da Nang and see the giant lady buddha statue. The statue is the largest of its kind in Vietnam at 67m. As you can imagine, it holds an imposing position on the skyline in Da Nang and the views back down the coast are impressive. I managed to get “seconded” into a photo session with some Asian tourists in which it felt like every family member was being carted in front of me for a separate photo. During the 5-minutes of courtesy smiles, I wondered if they thought that I was the buddha and, perhaps, hadn’t seen the huge white statue behind them. All in a days work when you’re tall and white at a tourist attraction in Asia. We discussed the next part of our travels. Having been in Vietnam for about six weeks, and nearly four months in Asia, did we want to continue north and see the city of Hanoi with a trip out to the famous Halong Bay, or look towards our next country of choice? I wouldn’t recommend anyone avoid Halong Bay, as it becomes clear here, I haven’t been. We decided that after the hectic nature and tour heavy lifestyle of El Nido, Philippines, that we wanted to move on from Vietnam. Halong didn’t seem to represent anything significantly different to El Nido and we wanted to move on to a new country and a new culture. For what it is worth, I was really pleased to have experienced Vietnam, it is a diverse country with a fascinating, albeit traumatic, history. I got to live out a dream that was 10-years in the making and was pleased to do it with a significant upgrade over the middle-aged men of Top Gear. Lou definitely challenged me during our time here, whether jumping on motorbikes or attempting karaoke on a party boat, we created some amazing memories together in Vietnam. For our encore, Lou and I decided to head closer to the city and enjoy a movie. Most of the films are shown in English with Vietnamese subtitles. This was fine with us. Strangely, and we arrived just as the movie was starting, the cinema was really quiet on a Friday evening for a blockbuster premiere. We made up a small contingent of about eight people spread across the seating area. This might have been one of my truly blond moments during our trip (and I’m sure there were more). I enjoyed the film, good but not great, and an easy couple of hours to switch off to some action. Why are movies not popular in Vietnam? The cinema foyer was busy, what did everyone watch? Only on exit did it dawn on me, our choice might not have been in best taste for this particular country – Captain America: Civil War. Our next stop is coming soon!